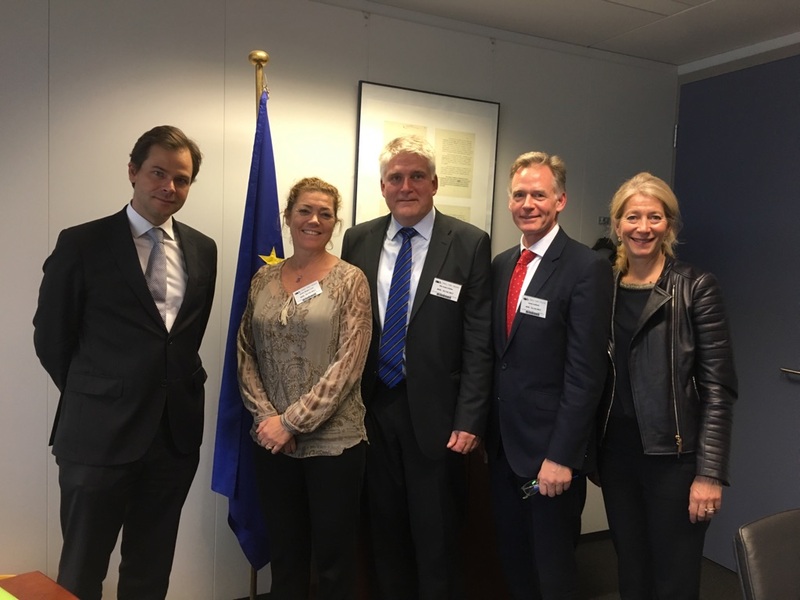 Yesterday, Confederation of Norwegian Enterprise – NHO, Statoil and SINTEF visited Head of Cabinet of Commissioner Moedas, Mr António Vicente and his Cabinet expert Keith Sequeira to discuss the framework and content of EU’s future Framework Programme for research, FP9. SINTEF was invited to join NHO to this meeting. NHO is the main representative organisation for Norwegian employers. António Vicente, Head of Cabinet Commissioner Moedas, Kristin Skogen Lund, Director General Confederation of Norwegian Enterprise (NHO), Nils Røkke, EVP sustainability SINTEF, Chair of EERA, Jannik Lindbæk, Head of Statoil office Brussels, Ingebjørg Harto, Head of NHO office Brussels. It is of importance that EU recognises the vast impact decarbonised fuel could have in the future from sustainably produced hydrogen including CCS. Furthermore, the Industrial Leadership pillar is important and that the three pillar approach should be pursued in a balanced way. The commission has high expectation for the establishment of the European Innovation Council which is set to boost innovation and bridge the gap between lower TRL to higher TRL’s. The SME support will be supported better. It is key that the vehicles at hand work seamlessly and an example of such an arrangement is the Norwegian Pilot-E. The mission orientation could at the highest level have links to the grand challenges of food, water, health and energy. The next months will be important to determine the structure and content of FP9 including the missions. I would like to thank NHO for inviting us to this meeting and for the very good discussions with the Head of Cabinet. We foresee a fruitful discussion in the time to come.